This entry was posted in Quantitative Self, Reading. Bookmark the permalink. This is an amazing list and I am totally doing it. Then it is already a complete success. I started keeping track of every book I read (excepting textbooks in law and theology) in 1967 and have maintained those records every since. That adds up to 1407 books in fifty years or 28 books per year. The high was 91 in 1989. The low was zero in 2001. 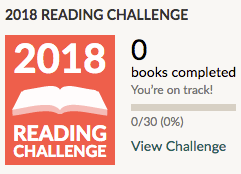 I read 30 books in 2017. You are a nerd and I am, too. That is why we even think about things like this.